Pizza Rollio is opening an outpost on Ninth Street between Avenue A and First Avenue, where it will sell its super-thin, arugula-topped pizza served in long strips that patrons can roll up. The pizzeria is owned by Miyuki Talwar and her family, who run similar establishments in the Philippines. This will be the third Pizza Rollio in the city, joining the Plaza Hotel Food Hall and on West 18th Street. In a city with pizzerias on almost every corner, Pizza Rollio serves the seemingly impossible: a totally unique pie. Its rectangular creations are light and delicate — built on paper-thin sheets of dough that are baked and sliced into wide ribbons perfect for wrapping around peppery bites of alfalfa sprouts and arugula, the salad-y condiment served with every order. In addition to its classic margherita pie, Pizza Rollio serves specials like “The Godmother" topped with fig, gorgonzola and mozzarella; the “Eggs Benedict” topped with Canadian bacon, fresh egg, chives and hollandaise sauce; and the “Mushroom Truffle Madness,” with mushrooms, truffle oil and mozzarella. 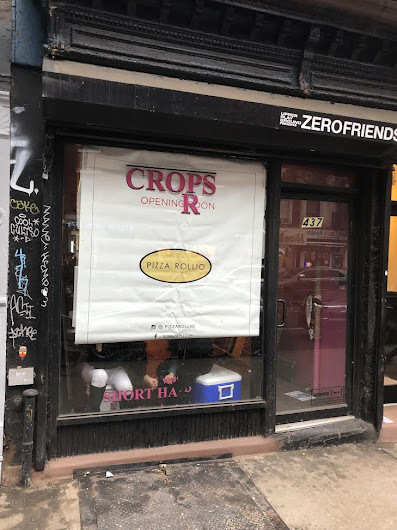 This storefront on Ninth Street was previously the longtime home of the salon Crops for Girls. Pizza so paper thin you can roll it up. Hmmmm, the dough is not typical pizza dough? And this is the third outlet? So when you roll it up, you end up with this giant roll that you have to attempt to eat, without squeezing the insides all over yourself? Sprouts and pizza have no business being in the same establishment together. EVER. Not sure what their thinking is regarding the demographics of the Plaza food court being in any way similar to 9th street and Avenue A except that both locations are across from a park? Come to NYC, we have pizza representing different exotic locations all over the world! That is to say except for good old fashioned NYC style pizza. We actually don't have much of that anymore. Sorry!